It always seems like we need more space! Cleaning up and clearing out once in a while helps, but sometimes you just need to add some space. I had an otherwise unused wall and put some simple baskets on some tracks you can find at your local hardware store. I get quite a few questions as to how these baskets were actually put up and so I'm going to show you all the details. 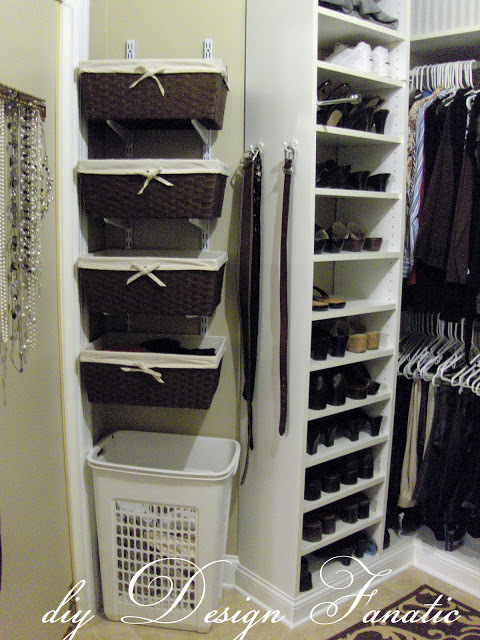 It's pretty easy and doesn't cost a lot to add storage space to your master closet. You can add lots of storage space by installing a double track system and either putting shelves or baskets on the tracks. First off, what I keep in the baskets changes seasonally. The bottom basket is filled with tank tops, which I wear both in summer and winter. One basket holds my sleep shorts and sleep pants. Another basket holds t shirts and the last one holds tops I wear while gardening or painting. 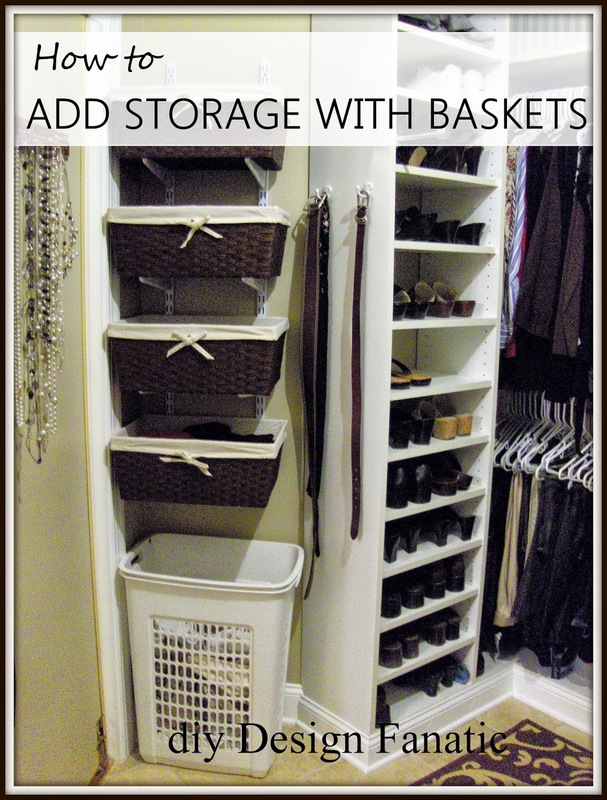 Baskets would be great for under garments, ties, hats, scarves or whatever else you have need to store in your closet. This is how it looks if the baskets are taken off. No need for shelves because the baskets sit directly on the brackets. The tracks are just screwed into the wall and the brackets are adjustable and can be moved up or down. Here's a closeup of the double track bracket. The photo isn't upside down, the label is. lol...still haven't taken a few of these off. You can find the tracks and the double track brackets at Lowe's or Home Depot. The tracks come in different lengths, depending on how much space you have. I found the baskets at HomeGoods several years ago, but I've seen similar ones at Target recently. There you have it...a relatively inexpensive way to add more storage space in a closet. This project can be finished in one afternoon. If you'd like to see more of my master closet, you can click HERE. Disclaimer: The above post is how we added space to our closet. I don't take any responsibility for any errors or results obtained from using this information. When using power tools, use safety equipment. What a fantastic idea! It's so easy to just grab what you need and you can see everything! I love baskets! You really fold up your tank tops, sleep shorts etc. that neatly?? wow. I couldn't do that and my baskets would end up looking a mess! I try...and I AM very organized, but not quite like that! Thus, I find the metal mesh drawers (ours are from Container Store system) to work well. They sort of "hide" my slightly unfolded things! I love your system though and it looks SO great in your closet! This is an awesome idea. I struggle so much with how to store the things you mentioned. I have a nice closet but there is NEVER enough room. And, I can see *why* it's been viewed almost 200,000 times! You are seriously the queen or organization, Pam! Would you please come help me tackle my closet ... ugh. I've been putting it off far too long and seeing your fabulously organized space (and awesome ideas) has inspired me to finally get started. Thank you! Love it Pam...where did you purchase your baskets? There are many ways to go about organizing your accessory. Different methods make more sense depending on your space and what you’re storing. No matter which method you choose, these storage solutions definitely helps you to reduce the space usage. Once again great post man! Cheers!